I remember enjoying takeout only a few times in my life. I grew up in a rural area, where restaurant delivery was out of the question. And when I moved to an area of reasonable proximity to takeout options, I was following a restricted anti-inflammatory diet. So, I had basically given up hope of ever stuffing my face with takeout classics like pad thai, moo goo gai pan, orange chicken, or fried rice. Until this week. 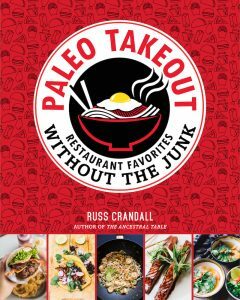 This week, I got my hands on a book that will make up for my lifetime of takeout deprivation: Paleo Takeout, by my friend Russ Crandall. You likely know Russ from his recipe-packed blog, The Domestic Man. Paleo-friendly versions of ethnic recipes from around the world. Russ will take you to Thailand with Thai Red Curry, then Japan with Tempura, then China with Sweet and Sour Chicken, and then America with a classic breaded chicken sandwich. Simple, practical preparation techniques. These recipes are for real people who have real time constraints. To sum up the theme of the recipes: family-friendly weeknight meals. Even the Asian recipes use accessible ingredients found at well-stocked health food markets. The more unusual ingredients are toasted sesame oil and fish sauce, which you can find at any large grocery store. I hope you enjoy this recipe that Russ agreed to share from his book. Don’t forget to check out Paleo Takeout cookbook here! Looking for an easy, kid-friendly dinner idea? Here you go! This recipe is shared with permission from Paleo Takeout by Russ Crandall. 1. In a saucepan, combine the sauce ingredients and bring to a simmer over medium heat. Reduce the heat to low and simmer gently to allow the flavors to marry while you prepare the chicken. 2. In a mixing bowl, combine the chicken meatball ingredients with your hands, then transfer to a food processor and pulse until the mixture turns into a tacky paste. With wet hands, form 40 balls. 3. You can either pan-fry the chicken meatballs in batches over medium heat or grill them over direct medium-high heat. If pan- frying, put the cooked chicken in a warm (200°F) oven while you make the other batches. 4. 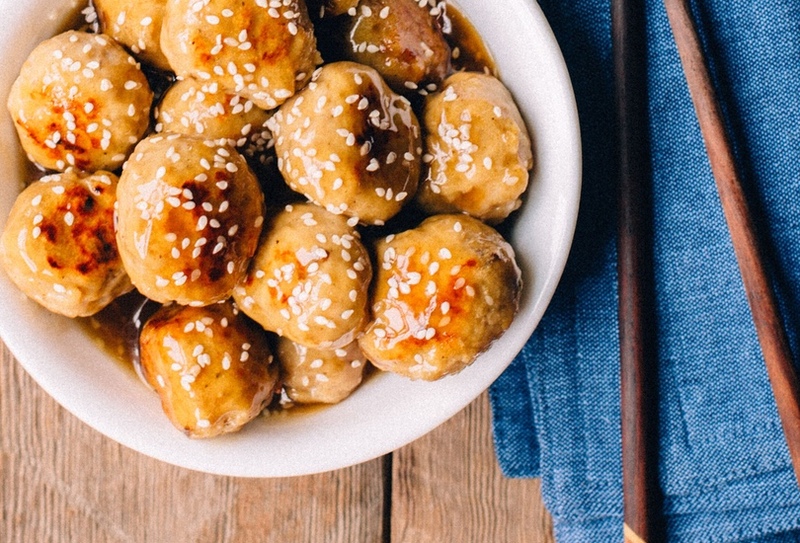 Once the chicken meatballs are cooked, stir together the arrow- root starch and cold water to create a slurry, then stir half of the slurry into the sauce. Increase the heat to medium, bring to a sim- mer, and cook until thickened, about 2 minutes, adding more slurry if needed. Taste and add salt if needed, then stir in half of the ses- ame seeds. 5. 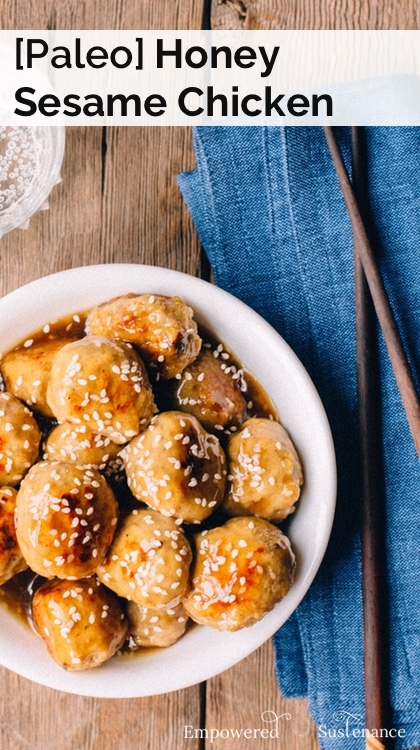 In a mixing bowl, toss the chicken meatballs with the sauce, then transfer to a serving dish. Sprinkle the remaining sesame seeds over the chicken and serve. This recipe can also be made with egg-battered chicken breast pieces. Follow the instructions in my Sweet and Sour Chicken recipe (page 64 of The Paleo Takeout Cookbook), but use this sauce. Or you can use velveted chicken breasts (see page 44 of The Paleo Takeout Cookbook). Finally, consider pan-frying some cut-up chicken thighs and tossing them in the sauce. Easy! Looks like you’ve got a sweet tooth, Lauren! Nearly every recipe is a sweet one. Even though it’s paleo and some are anti-inflammatory, it seems to me that keeping up that level of sweets isn’t a great idea for anyone’s health. A little here, a little there — doesn’t it feed the carb cravings? (Full disclosure: I eat a ketogenic diet, which does include some dairy. No grains. Mostly berries for fruit. Sugars/sweeteners of any kind are a real rarity). I share treat/sweet recipes on my site because I find that these are the most difficult to adapt to a grain free lifestyle. Meat and vegetables are already paleo 🙂 But I encourage my readers to enjoy sweet recipes/treats as just that – treats. Sounds delicious- I need to get my hands on that cookbook! I agree with @Jenna. I need my carbs and would never survive on a ketogenic diet. I am in love with your website, and it has given me hope and so many great ideas. Thank you so much, Lauren. I made this last night and everyone loved it. I have 4 kids and it’s very rare that I cook something that they all will eat. I tried this recipe with chicken breast pieces and it is amazing. Thanks for the recipe. The husband loves it. This is sooo good – my family is a bit suspicious of Paleo meals that imitate non-Paleo food (and rightly so), but everyone in my family (even my super picky pasta-vore brother) LOVED it! It means so much to me that they’ll eat it, and thank you for putting this up on your website! (as a teen, I don’t have a big budget for cookbooks). I’d also like to thank you for being so candid in pictures of your life – next year I”m heading off to college, and I want to cook almost all my food. Your advice and reviews of merchandise you deem important are helpful for today’s young people who wish to improve their lives! Thank you for filling a massive void in the blogging universe – a respectable, evidence-based, health-oriented website written by a young woman close to my age is really hard to come by! I am new to the Paleo world and was lost before I found your recipes. Thanks for sharing!!! Sounds tasty, as many of your receipes! I just want to point out that the linked Cooking wine here contains as first ingredient CORN SYRUP. as this is something many folks here want to avoid, be aware. Maybe you can link a paleo/aip Cooking wine? I’ve found that in most Chinese recipes, the cooking wine can be replaced with a dry sherry. The alcohol evaporates and you only need a little splash so it won’t taste boozy.